Trash-to-fuel technology could be the quiet front-runner in the next-generation of biofuels. 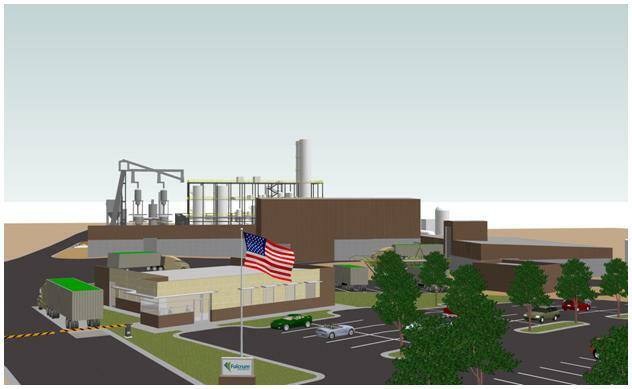 Fulcrum BioEnergy, for one, is paving its way to reaching that goal: the company said Tuesday it has lined up $75 million and plans to start building its first commercial refinery this summer. The Pleasanton, Calif.-based company said the funding is the final equity financing it needs to start building a $120 million processing plant, called Sierra BioFuels Plant, just outside of Reno in Nevada. Fulrum vice president of administration Rick Barraza declined to disclose the investors in the round. Not all $75 million will be used to build the plant; some will be used for day-to-day corporate operations. The company is still waiting for a loan guarantee from the U.S. Department of Energy, however. Fulcrum expects to complete negotiations of the loan guarantee in the next few months, said Barraza. The DOE recently announced its first biofuel loan guarantee offer, and that $241 million guarantee went to Diamond Green Diesel. The U.S. Department of Agriculture (USDA), meanwhile, announced three loan guarantees recently totaling $405 million to three biofuel producers, including trash-to-fuel maker Enerkem. Fulcrum says it expects to complete construction of its plant, which will have the capacity to produce 10.5 million gallons of ethanol per year, in late 2012. The company says the plant will also be equipped to make propanol, a solvent commonly used in the plastics industry, and Fulcrum plans to produce 16 MW of electricity onsite to run its operation. We should pause here and note that Fulcrum’s deadline for completing its plant is rather aggressive, particularly if it’s factoring in a swift awarding of a DOE loan guarantee into the timeline. We’ve seen enough missed deadlines by numerous next-gen biofuel makers that have struggled with technical problems and raising money. When I first spoke with Fulcrum in the summer of 2008, the company had bullishly predicted that it would start building the Sierra BioFuels plant that same year. When it does get built, the plant will operate by turning garbage into ethanol using a gasification process that bakes shredded pieces of trash at high temperatures to produce synthesis gas. The syngas then goes through a purification process to get rid of particles before going through a catalytic process to convert the gas into ethanol. Fulcrum has licensed the gasification technology from InEnTech, and is using a catalyst that was jointly developed by Nipawin Biomass Ethanol New Generation Co-operative and Saskatchewan Research Council in Canada. Syngas will run through the catalyst that turns the carbon molecules from the syngas into fuel.Earlier this month, Fulcrum said it had signed a 15-year agreement with Waste Management of Nevada to buy municipal trash for the refinery. Will Fulcrum turn out to be just another next-gen biofuel maker that lines up deadlines, only to struggle to reach commercialization? Startup Range Fuels managed to get private equity and federal financial aid to build its first commercial plant last year, but it’s still not mass producing ethanol. In fact, the company confirmed earlier this month that it was laying off workers, and its technical adviser (and founder), Bud Klepper, told Georgia Public Broadcasting that the company was shutting down its plan to tackle technical issues and find more money.